Stellaris may be on the cusp of welcoming its first official Species pack later this week, however its keen modding community has hardly taken a breath since the game’s launch back in May. 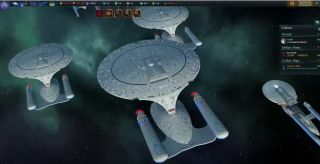 The latest mod to impress is G-Man’s Star Trek New Horizons—a total conversion that follows the entire canon timeline from 2150’s Enterprise era through to 2400 and beyond. It’s in the early stages of development, but New Horizons already packs a host of tweaks and tinkerings that give Stellaris a flavour of the ST universe. There are 38 pre-scripted races, for example, with canon starting positions; as well as five playable factions and their ships, including: United Earth, the Klingon Empire, the Romulan Star Empire, the Vulcan High Command and Gorn Hegemony. While not exclusive to this mod, civilian trade is also a welcomed addition. Relevant to the Enterprise era and that of the original series, the mod introduces replica uniforms and portraits specific to each time period; it adds new Torpedo weapons and shields; new races; and the The Borg in place of the Scourge crisis events featured in the original game. The full list of changes can be found on the mod’s Steam Workshop and ModDB pages and, as it’s a work-in-progress, promises to add more in the coming months. "As this will be a total conversion we plan on creating a whole new canon static universe with proper factions, ships, portraits and storytelling," says its creators. "Prepare to relive your favourite episodes and movies, this mod will guide you through the entire canon Star Trek timeline."